1) Private. I will consider sharing the information if you have a direct interest in my own family. 2) Freely available. Please only use it for private, non-profit research. 3) Available for purchase. PayPal only. This book was printed in 2012. It contains my understanding of the family history of my wife and I at that time. Inevitably new facts and old errors have since been discovered, but it now forms the basis for further research. You can see the skeleton of the work here. So that the privacy of living individuals is respected, I have not made it available for download. Please contact me if you would like to see sections of it which are relevant to your own family. 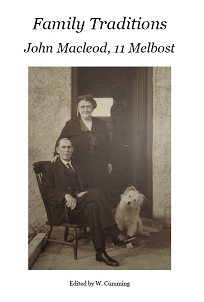 - Her brother, Donald Roddy Macleod , was on the editorial committee (see page 3). - He was also the author of 'An Elegy', a tribute to his brother Norman, who drowned when the HMS Rawalpindi was sunk in 1939. The vast majority of the material contained within this work is courtesy of the grand-daughter of John Macleod of 11 Melbost. She has preserved his writings over the decades. I am indebted to her for permitting me to make this information generally available. If you are interested in purchasing more than one copy, please contact me so that we can discuss postage costs and a possible discount. I am also selling this booklet on eBay, although at a higher price to cover their fees. This booklet can also be purchased directly from Urras Eaglais na h-Aoidhe who are, I believe, selling it in Buth an Rubha, Point, Lewis.